Make a thick béchamel sauce (white sauce) by melting 2 tablespoons butter in a little pot. Add the flour and stir. After 2 minutes start adding the milk bit by bit, stirring continuously to prevent lumps from forming. Keep on stirring until the mixture thickens and comes to the boil. Remove from the heat, season and stir half the cheese and all the mustard into the sauce. Set aside. 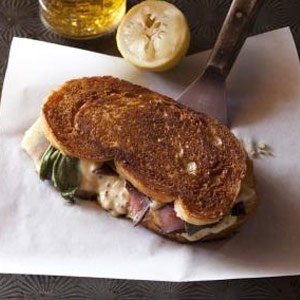 Divide the rest of the cheese, sage and biltong across the unbuttered sides of four slices of bread. Top with a spoonful or three of white sauce – not too much, otherwise you won’t be able to turn the sandwich. Top with the other slices of bread, buttered sides out. Heat the rest of the butter and oil in a pan and fry the sandwiches on both sides until golden brown and crisp. Squeeze some lemon juice over the sandwiches before tucking in, or serve with gherkins and homemade pickled onions.